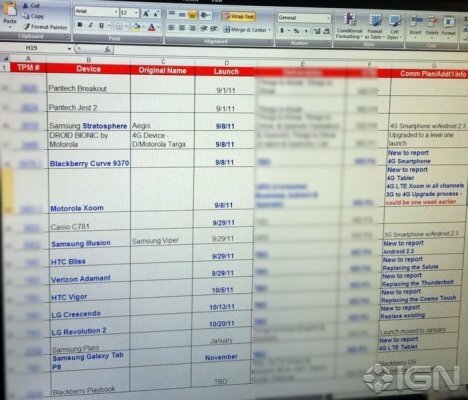 Verizon Roadmap Leaked, Galaxy S2 Coming Early September? This leak is leakier than the Titanic! An iceberg has split Verizon in two, exposing the company's secret phone launches! It's amazing how much one can learn from this one document. Wondering when the Galaxy S2 will launch on Verizon? Heard the story about the new ladyphone by Android? These things are all launching on Big Red, and soon! Let's grab a rescue boat and take a tour of the broken vessel. Samsung Stratosphere – This phone will be coming with 4G LTE capabilities and Android 2.3. In other words, this is the Galaxy S2 (!) And it will be launching September 8th. Motorola DROID BIONIC – No codename for this one. The Bionic will launch on September 8th as well, a day that will go down in the history books. Samsung Illusion – Could this be the Galaxy R? It's most-likely a mid-level 3G phone but with Android 2.3. It will be launching September 29th. HTC Bliss – The rumors are true! Looks like HTC really is launching a ladyphone, though we still don't know if it'll come packed with patronizing weight-loss apps. Launching September 29th. LG Revolution 2 – We know nothing. Launching October 20th. Samsung Galaxy Tab PS – We also know nothing. Launching sometime in November. Well, that's it, folks. Of course, all of these dates are liable to change at a moment's notice. Still, we're hoping it's all true — except the name Samsung Stratosphere, which conjures memories of that schlumpy tower in Las Vegas.